Chapter 1: How Tall Can Your Child Become? This is the ultimate guide to helping your children grow taller. I’m NOT going to give you general tips you’ve already heard a thousand times, like “eat well, do stretches, and sleep a lot”. You’re about to learn the EXACT step-by-step blueprint for helping your children reach their full potential height by adulthood. Now, it doesn’t matter whether your child is a 3-year-old toddler, or a 16-year-old teenage boy. Because this guide contains strategies that work for ANYONE who is growing, no matter how young or old. Bottom line: if you want your children to be happier about their height, you’ll love this guide. This guide has literally EVERYTHING you need to know in order to maximize your child’s height. In Part 1, we’re going to talk about the basic fundamentals you need to know to ensure that your child grows properly. In fact, just by reading Part 1, you’ll know 80% of everything he needs to do to reach his full potential height as an adult. And by the end of this part, you’ll get a better idea of how much taller your child can grow by using this guide. In Part 2, we’re going to discuss additional strategies that will help your child boost her height even further. Also, if your child is almost (or fully) done growing, or has a condition that may affect her height, you’ll find this chapter useful. And as a bonus: you’re going to learn exactly how to motivate your child to take action on this guide. Now, if you’re truly serious about helping your child maximize his height, you’re going to want to read from the beginning to end. But if you want to skip to a certain chapter, you can always click the Table of Contents icon on the top right corner. Either way, I highly suggest that you bookmark this page on your browser, so you can read the entire guide at your own pace. Make sure to take good notes, and take deliberate action. And most importantly, consult your doctor before your child makes any radical changes to her lifestyle. With that, let’s dive right into part 1 of this guide. How Tall Can Your Child Become? How Tall Can Your Child Actually Become? You’ve probably heard over 1293 times that your height is limited by your genetics. But in reality: Non-genetic factors can make or break your child’s height. To prove my point, we’ll look at a few real-world examples that show how much influence environmental factors have on your child’s height. And by the end of the chapter, you’ll know how much difference this guide can make for your child. There is an overwhelming debate about how much your genetics affect your height. On one hand, many experts claim that about 80% of your height is determined by your genetics . Other experts claim that genes account for only 10% of the differences in adult heights . How much can YOUR child actually grow? Your child can become much taller than you or your spouse. To convince you that this is possible, let’s look at 3 real-life case studies that prove how important non-genetic factors can be for your child’s height. We both know who Michael Jordan is for his legendary accomplishments on the court. But you might not know about something incredible he accomplished outside basketball. It’s outgrowing his parents by several inches. Specifically, Michael Jordan became 6’6″ tall as an adult, while his father was only 5’9″, and his mother was around 5’5″ tall. In other words, Michael grew to become 9 inches (23 cm) taller than his dad! Now, he’s not the only basketball player who was able to accomplish this feat. But you may be thinking: They’re pro basketball players! They’re out of the ordinary! So I’ll give you another example. And I’m sure that you know several people who are taller than the rest of their family. Well, maybe their tall genes came from their grandparents, and skipped their parents and other siblings! You may be right about that too. That’s why I’m about to show you case studies that are even more convincing. You probably know that North Koreans don’t get to pig out at Boston Pizza every day. But how much does malnutrition affect their height? As you can see below, North Koreans are up to 8 cm (3.1 inches) shorter than South Koreans on average. But do the 2 Koreans have different genes? Not really. In fact, North and South Korea were together as one nation for 1000s of years, and separated less than 100 years ago (after World War II). Up until World War II, the Japanese ate mostly rice. But after the war, the Japanese added more animal proteins and fats in to their diet. They grew over 3 inches over the past few decades [5, 6]. So, does this mean that feeding your child more proteins and fats can make him grow 3 inches taller? Potentially. But more can be possible. Now, did these countries magically alter their genes during these years? Of the 4 European countries, let’s zoom in on Netherlands. As you can see, their median male height increased by around 19 cm (7.5 inches) as their income improved over the years. But what did raising income have to do with growing taller? According to Dr. Randal Olson, improving their income likely gave them access to an abundance of healthier foods, which would’ve helped them improve their nutrition . It makes sense why Dr. Olson and other experts emphasize the importance of nutrition and health when it comes to growing taller [2, 7, 8]. As you witnessed, the average height of several countries increased noticeably over the years, while their genes stayed the same. While genetics have their place, your child can increase his adult height substantially by optimizing non-genetic factors (such as nutrition). Now, keep in mind that these countries didn’t deliberately try to grow taller. But by simply improving their nutrition, health, and overall quality of life, their height increased substantially. And luckily for you, I’m going to show you how to do just that. If you want to ensure that your child is growing at the right pace, you must nail this process. And in this chapter, I’m going to show you a simple 2-step process to track your child’s growth with maximum accuracy. Let’s dive into each step one at a time. Measuring your child’s height isn’t rocket science, but it’s important that you measure her accurately every time. Because if you don’t, you can’t go back in time to measure her again (obviously). Since our heights fluctuate from morning to night, it’s important to measure your child around the same time of the day. I recommend measuring in the morning, since your child’s height will differ each evening (depending on what activities she engages in throughout the day). Now, you DON’T need to measure at the exact same time each day. Just measure her height as soon as she gets up. Sleep is important for growing taller, since that’s when majority of height growth happens. For now, just know that by sleeping sufficiently every night, her spine length will stay consistent every time you measure her. This may seem like common sense, but you’d be surprised by how many people overlook this rule. If you measure your child’s height with different rulers, you WON’T get consistent measurements, since every ruler is slightly different. So pick a measuring ruler that you will use for the next few years. I recommend using a simple tape ruler. The rulers you stick to walls isn’t too reliable, since you may move homes in the years to come. And if you’re absolutely nuts about precision, you can get yourself a stadiometer (but I don’t think it’s worth the price). After you pick your ruler, it’s time to measure your child’s height. Remember: You can only measure her correctly the first time, so make sure you nail it! In other words: if you’re going to measure her every month, measure her every month. If you’re going to measure every 3 months, measure every 3 months. This will spread out her measurements evenly, which will help you spot unusual changes in her growth much more clearly. So how often should you measure? I recommend measuring once every month OR once every 3 months. Every day or every week is too often, because your child will have barely grown. And if you wait longer than 3 months between measurements, you won’t have enough data to know if your child is growing at the right pace. But whatever frequency you choose, make sure to keep it consistent. Unfortunately, there is no way to know EXACTLY how tall your child should be at every age. But this shouldn’t stop you from knowing if your child is growing at the right pace. Thankfully, there are many tools and resources that can tell you if your child is growing properly. And by far, the best tool for tracking your child’s growth is the growth chart. You’re ready to track your child’s growth. For this example, we’re going to use the Growth Chart to track Tom, who is 6 years old, and is 3′ 7″ tall. So, what are these 2 numbers exactly? 2. The second number is Tom’s Predicted Adult Height (which equals 66 Inches or 5′ 6″). So you’re probably wondering: what is a growth percentile, and why is it important? Since Tom’s Growth Percentile is 10, it means that Tom is taller than 10% of children who are also 6 years old. For example, if your child’s growth percentile is 70% when she’s 7 years old, 75% when she’s 8, and 80% when she’s 9, it shows that your child is growing normally. 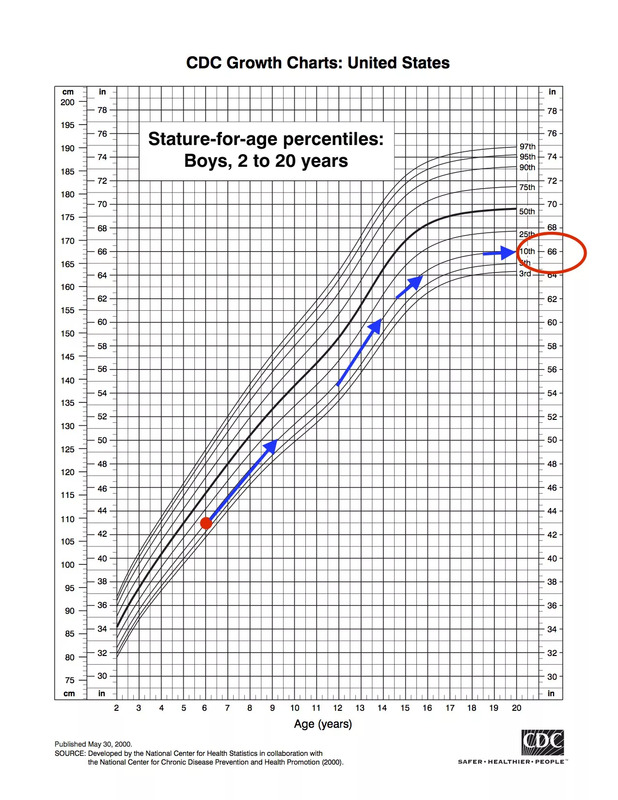 When Is It Normal For Your Child’s Growth to Fall Off Her Growth Percentile? It’s important to remember that these growth charts are simply estimations. Therefore, it’s normal for your child’s growth percentile to fluctuate (to a certain point). During her growth spurts, your child’s growth percentile will tend to fluctuate more than usual, since everyone goes through growth spurts at different times. Having said that, if you notice that your child’s growth percentile falls off drastically at any point, make sure to seek help from a pediatrician. The goal for your child is to increase her growth percentile by the time she becomes an adult. Now, you shouldn’t expect your child to go from 5% to 95% by adulthood, since genetics does play a role here. But as we discussed in Chapter 1, non-genetic factors can also plays a HUGE role in how tall your child becomes. Therefore, by doing the right things, it’s possible for your child to increase her growth percentile by the time she becomes an adult. And in the following chapters, I’ll show you how to optimize your child’s lifestyle for maximum growth. This guide will help your child increase her growth percentile by the time she becomes an adult! HGH lengthens your child’s bones throughout her childhood and teenage years . So the more HGH your child produces in her body, the more she’ll grow. And in this chapter, I’m going to show you exactly how your child can optimize her HGH levels for maximum growth. ➊ How does HGH make you taller? ➌ How do you know if your child has too little HGH? ➍ How do you know if your child has too much HGH? ➎ How can your child optimize her HGH levels for maximum height growth? HGH, growth hormone, and human growth hormone all mean the same thing! So with that out of the way, let’s tackle each question, one by one. How Does HGH Make You Taller? HGH is produced in a small region inside your brain called the pituitary gland. And when HGH enters your blood and reaches your bones, it signals your bones to grow in length [13, 14]. So the more HGH your child produces from her pituitary, the longer her bones will grow [13, 15]. And in the next few chapters, I’m going to show you how your child can boost her HGH levels to maximize her growth. Many people think that HGH is a dangerous substance. Because HGH is a hormone your body secretes naturally from birth. So why do people think HGH is so dangerous? Because they confuse natural HGH with synthetic HGH. As you can guess, natural HGH is safe since your body produces it naturally, but synthetic HGH can be risky if not used correctly . And in the next few chapters, I’ll show you how your child can boost her natural HGH for maximum growth. But if your child severely lacks HGH in her body, synthetic HGH may be necessary to help your child grow normally . How Do You Know If Your Child Has Too Little HGH? One of the most obvious signs of HGH deficiency is growing abnormally slow. Now, if it’s hard to spot any of these symptoms, she probably isn’t suffering from an HGH deficiency. And if that’s the case, all you have to focus on is increasing her HGH levels naturally (which we’ll get into starting next chapter). Resort to an HGH treatment. In Chapter 9, I’m going to tackle Growth Hormone Deficiencies much more in-depth. How Do You Know If Your Child Has Too Much HGH? On the flipside, there is a chance that your child might have too much HGH in her body. Here’s a 22-year-old patient who has abnormally high HGH levels, standing on the left side of her identical twin! If your child has this condition, you should aim to REDUCE her HGH levels at all costs. So if you notice any of the symptoms I listed above, make sure to speak to a pediatrician for acromegaly treatment options. In Chapter 10, I’ll cover Acromegaly in much more detail. How Can You Optimize Your Child’s HGH Levels for Maximum Growth? How can your child increase her natural HGH levels for maximum height growth? There are a few important factors that you need to optimize to increase HGH naturally. And that is what the next two chapters are going to be all about. If you had to pick just ONE CHAPTER to read in this guide, it would be this one. In fact, a study has shown that nutrition is the MOST important non-genetic factor that contributes to your child’s growth . And if improving nutrition helped the entire Japanese population grow taller by 3 inches , it will help your child grow taller as well. How can you optimize your child’s diet for maximum growth? By feeding him foods that are scientifically-proven to maximize his growth. There’s a flood of information online about which nutrients are the most important for lengthening your bones. But luckily for you, I’ve done the hard work by putting together information from 100s of scientific articles, and compiling the MOST important nutrients your child needs to maximize his height. And from my findings, there are 5 main nutrients your child needs to consume if he wants to maximize his bone length. In this section, I’ll briefly explain why each nutrient is important for growth, and lists of foods that contain the MOST of each nutrient. And at the end of the chapter: I’ll give you a COMPLETE chart with all of these foods. This is the most important nutrient your child needs to grow taller. Because Amino Acids increase your HGH levels. To recap: HGH is what signals your bones to grow in length . That’s why it is critical that your child maintains high levels of HGH. Don’t worry, you DON’T need to memorize these Amino Acids. Because I’ve already found foods that are high in one or a combination of these Amino Acids. Before I explain why Protein is important, let’s quickly look at what your bones are made up of. And since collagen is a Protein itself, your child needs to consume enough Proteins to build healthy bones. Foods that are rich in Proteins usually contain Amino Acids that increase your HGH! So by consuming Protein-rich foods, your child can simultaneously increase his HGH, while feeding his bones with the nutrients that they need. Besides Protein, your bones also need Vitamin C to manufacture collagen in your bones. Simply put: Protein is the building block of the collagen, while Vitamin C is the material that holds the collagen together. And without enough Vitamin C, the collagens in your child’s bones will become weaker, which will disrupt proper bone growth. This is probably not a surprise to you. In fact, I remember being nagged by my mom EVERY DAY to drink milk. Calcium (along with collagen) is the foundational building block of your bones. And fortunately for your child, there are MANY sources of Calcium. Vitamin D3 is another important nutrient for your bones, since it allows your to absorb Calcium. In other words, your bones CANNOT use Calcium without enough Vitamin D3 in your body. But just like Amino Acids and Protein, many foods that contain lots of Calcium are also rich in Vitamin D3. Now, your child DOESN’T need to eat EVERYTHING on this list. Just ask your child which foods he likes best, and make sure he eats them regularly. How Much of Each Nutrient Does Your Child Need Each Day? How much of each nutrient does my child need to consume every day? Since everyone’s body is different, I can’t give you an exact amount to aim for. And the good news is that you DON’T even need to nail your nutrition intake to the tee. But if you want to go the extra mile, I’ve gathered some useful resources for you. Since many Protein-rich foods contain Amino Acids that increase HGH, feeding your child with enough Protein every day will optimize his HGH levels . Remember: there’s no need to follow this chart right on the dot. As long as your child eats foods that are rich in these nutrients, he’ll be good. However, children with certain conditions may need more (more on this in later). Eating lots of Vitamin D3 foods, and enjoying 10 to 30 minute sunbathes are the best ways to get enough Vitamin D3 each day [26, 27]. Just make sure to avoid direct sunlight in the summer (between 10am to 4pm) . Eating too much sugar can skyrocket his insulin beyond what’s healthy, which can decrease his HGH levels . In other words, if your child consumes too much sugar, he won’t grow as much. In fact, when I was a kid, I LOVED snacking on candies and chocolate all day. So how in the world can you convince your child to eat less sugar? And later in this guide, we’ll go over several ways to encourage your child to take all the right actions. Up to 75% of HGH is produced during sleep deep sleep . …but she needs to get enough deep sleep every night . So how can your child sleep deeper than a Koala? By incorporating 6 Height Maximizing Sleep Tips. And that’s what this chapter is going to cover. How much sleep your child gets every night will directly impact how long her bones grow. It’s just as important to go to sleep at the right time. So when is the best time to go to sleep? Aim to get your child in bed before 10pm. Because your growth hormone levels peak between 10pm and 2am [32, 33]. Now, let’s face the REAL challenge. If your child is in her teenage years (or close to it), it’s going to be a battle to get her to sleep before 10am. So how can you convince your child to sleep that early? Simple: Show her this graph! If your child knows that sleeping during these hours will make or break her height, she’ll be much more motivated to sleep earlier. And throughout this chapter, I’ll show you scientifically-proven strategies that will help her sleep earlier and more deeply. The best way to get lots of deep sleep is to get enough sleep to begin with. So how many hours of sleep does your child need every night? Many experts say that you need at least 7 to 8 hours of sleep. Thus, sticking to conventional tips like “sleep 8 hours a day” is a recipe for poor sleep. So how do you know how much sleep your child needs for maximum height growth? By letting her wake up naturally (without an alarm clock). When she wakes up without any alarm, it shows that her body is fully rested and doesn’t need any more sleep. So if you want to ensure that your child gets enough sleep every night, make sure she wakes up when she wants to. …it will also help your child maintain a taller posture (more on this later). So what is the best sleeping position for proper growth? This will ensure that your child’s spine will be in its neutral position, and her head, neck, and spine will all be properly aligned, which is critical for growing properly. So how can you get your child to sleep on her back, WITHOUT a pillow? 1. If your child is a side or stomach-sleeper, encourage your child to start sleeping on her back. 2. Once she feels comfortable sleeping on her back, get her a thinner pillow. 3. Allow her to sleep on this new pillow until she’s fully comfortable. 4. After getting used to her thinner pillow, reduce her pillow size further. 5. Repeat steps #3 and #4 as many times as necessary, until your child can sleep without a pillow. Now, there is one important point I need to mention. For your child to sleep without a pillow, she must become a back-sleeper first. Because if your child is a side-sleeper, a pillow will keep her spine in a neutral position . By following the above 5 steps in order, your child can optimize her sleeping position safely, and maximize her growth. Another strategy to maintain an optimal posture (for deeper sleep) is to sleep on a medium-firm surface. Studies have shown that medium-firm mattresses keep your spine in proper alignment, and also reduce lower-back pain [37, 38]. If your child’s mattress is too soft, her body will sink too deeply into the mattress, bringing her spine out of alignment. On the other hand, super-hard mattresses can be uncomfortable for your child. So how can you find out which mattress-firmness is best for your child? 1. Bring your child to a mattress store of your choice. 2. Get her to lie down on mattresses with different firmness levels, so she can get an idea of what makes her feel comfortable. 3. Ask her to pick the mattress that feels firm, but also makes her feel comfortable. 4. Install the mattress in her bed frame, and get her to sleep on it for a few days. 5. If she feels comfortable, she should stick with it. If not, repeat steps 1 to 4. Remember: aim for comfort first, firmness second. So far, we talked about when and how long your child needs to sleep. Sleeping in an optimal environment. If you want your child to get enough deep sleep, she must sleep in a room that promotes full relaxation, and get rid of all distractions at night. 1. Find the optimal room temperature for your child. Aim for 60 to 70 °F (16 to 21 °C), but remember: comfort over everything! Depending on how rebellious your child is, the last 2 tips may be a challenge to pull off. But make sure to follow through with the first 3 tips as much as possible. Besides optimizing her sleep environment, it’s also important that she does the right things BEFORE sleeping. Specifically, she’ll want to do the right things during the day, and within 3 to 4 hours before bed. And in this section, I’ll show you steps she can take during the day, and before bed. There’s no evidence that maintaining a good posture helps your bones grow longer. So why is this chapter even here?? So in this chapter, I’ll briefly explain how correcting your child’s posture can do each of these two things. And afterwards, you’ll learn the exact steps your child can take to optimize his posture (for maximum height AND body strength). As you can see, the twin on the left appears much taller, EVEN if the length of all their limbs are exactly the same. And by fixing his posture, your child can gain an inch instantly (depending on how bad his current posture is). Fixing your child’s posture won’t only help him appear taller, but will actually increase his spine length over time . In part 2, I’ll explain how this is even possible. But for now, know that your child can gain a freebie inch by fixing his posture alone. As you can see, their height is more or less the same. But if my child was a jenga tower, I’d want him to look like the left tower. Because the left tower is stronger and more stable. Even though each tower contains the same number of blocks (and are similar in height), the left tower is much more stable, because its blocks are properly aligned. And these two towers are analogous to your child’s posture. If your child maintains a poor posture, his bones will become misaligned (like the right tower), which can cause him to develop problems in his bones and joints. But if he can maintain a proper posture, his bones will grow in the proper direction, which will condition his body to become strong and stable as the left tower. Not only can fixing posture make your child taller instantly, but it will be the difference between having a strong and a weak body. And in this chapter, I’ll show you how your child can optimize his posture to become taller AND stronger. As you can see, the spine is slightly curved (but not too much). So when your child is standing, sitting, or even lying down, this is how you want his spine to look. This is the most important postural technique to implement. Because let’s face it: no matter how active your child is, he’s going to spend a good chunk of the day sitting. So it’s important that your child sits in a proper position. 6. If your child is sitting in front of a computer, make sure the top of the monitor is 18 to 24″ away from his eyes. So after explaining how to sit properly, you’re telling me to avoid sitting?! No matter how much your child fixes his sitting posture, it doesn’t mean that he can sit all day without any problems. Not only does sitting for too long bring your posture out of proper alignment, but sitting has been proven to cause serious health problems . So how can you help your child sit less during the day? Your child probably won’t remember on to get up regularly on his own. But by installing a timer that goes off regularly, your child can easily remember to get up and walk around. I use a free app called Awareness, but there are a TON of other Pomodoro timers you can pick from. Get your child to lie down on his stomach. This will take a lot of load off of his spine, and also stretch out his back, which can help to neutralize his spinal alignment . This is one of the best ways to sit less throughout the day. Not only can standing desks help your child keep a better posture, but it can bring about many health benefits as well . But remember, if you want your child to start using a standing desk, gradual change is key. When first using a standing desk, he should start by using it for 30 to 60 minutes per day, and work his way up as he gets more comfortable . Now, this posture isn’t hard to mimic. But the REAL challenge is maintaining it. So how can your child remember to maintain this posture regularly? 2. The back of his feet, buttocks, shoulder blades, and head should all be touching the wall. If your child slouches often, this should help straighten out his posture. And in the next chapter, I’ll show you the BEST exercises your child can do to easily maintain his new posture. This is my favorite postural technique by far. A posture corrector makes all the techniques we just went through, 10x easier. By wearing a posture corrector throughout the day, your child won’t need to constantly remind himself to keep a straight posture, because the strap will remind him to do so. Once you wear this thing, it forces you to maintain a good posture, because slouching puts pressure on your shoulders, which reminds you to stand or sit tall every time you do slouch. Now, I’ve tried many different ones, but the posture corrector made by Selbite feels the most comfortable for me. But you can search posture corrector on Amazon, and find very cheap ones for under $20. Maintaining a good posture goes beyond becoming taller or stronger. In fact, having your chest out can boost your confidence, and make you feel better (instantly) . Feeling confident can improve your posture as well! In one of Tony Robbins’s seminars, Tony helped a man go from depressed to confident in a matter of seconds. The man’s chest popped out, which instantly fixed his posture. And if your child feels more happy and confident on a regular basis, his chest will pop out too, which will make it much easier for him to maintain his optimal posture. Stay tuned, because in the Bonus Chapter, we’ll talk about some strategies to make your child more happy and confident. You’re officially one-half of the way through this guide. But before you move onto the second half, I’d like to know what’s on your mind right now. Specifically, which tip are you most eager to start implementing? Are you excited to start measuring your child’s height? Are you thinking about ordering a posture corrector on Amazon? Or maybe, you already printed out the food chart from chapter 4. Either way, let me know by leaving me a comment below! And afterwards, check out part 2 of my guide.